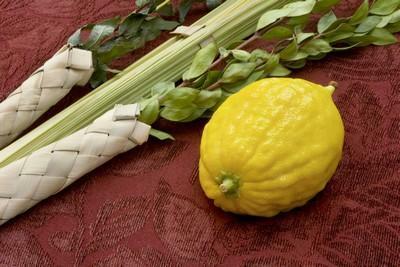 One of the most important holidays in Judaism, Sukkot, falls in the Hebrew month of Tishrei between September and October. In Ancient times when the Holy Temple was in Jerusalem, Sukkot was one of three pilgrimage holidays and at that time all the Jewish people would come to Jerusalem to offer sacrifices. This is a predominantly festive holiday that fundamentally combines both religious and agricultural rudiments. The holiday of Sukkot commemorates the time when after the exodus from Egypt the Israelites lived in temporary booths in the desert. These booths were built with walls made of wood or cloth on 3 sides and a roof constructed of tree branches, usually palm fronds through which the sky is visible and today all over Israel these booths can be seen in the gardens and even on the balconies of homes. During the seven day holiday of Sukkot, religious Jews are obligated to eat all meals and sleep in the Sukka. Ceremonial blessings are held using four types of plants: willow, palm shoot, myrtle branch and citron. Sukkot falls after the end of the summer harvest but before winter crops are planted and prayers are made thanking God for the harvest that was received in the previous year and praying for rain in the coming winter. This holiday is also celebrated by many Christians from around the world, thousands of whom come to the Holy Land from around 100 different countries at this time to take part in the celebration of the Feast of the Tabernacles that has been sponsored by the International Christian Embassy Jerusalem since its inception in 1980. During the 7 days of the Feast of Tabernacles many interesting events are planned, seminars covering various subjects as well as musical events with orchestras and choirs.